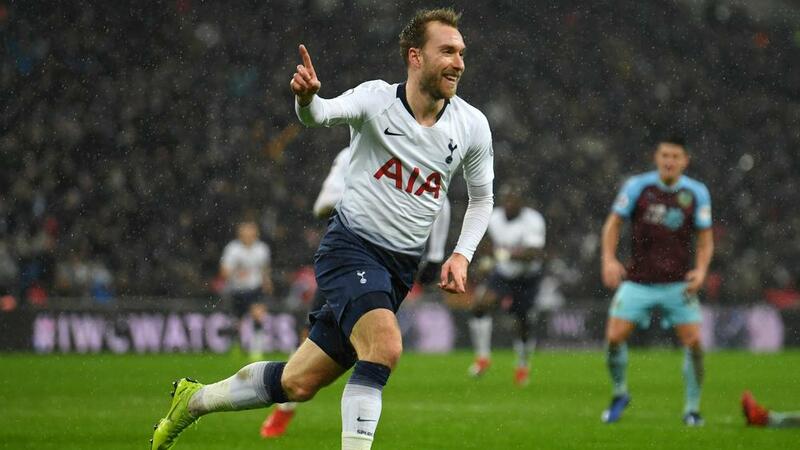 Christian Eriksen struck in injury time to give Tottenham a 1-0 Premier League victory over Burnley on Sunday (AEDT). Sean Dyche's men withstood the pressure in front of a sparse crowd at Wembley, thanks partly to two excellent saves from goalkeeper Joe Hart, until substitute Eriksen scored in the 91st minute. Mauricio Pochettino made five changes to the team that drew with Barcelona this week, handing a first Premier League start to 18-year-old Oliver Skipp, and his side certainly lacked their customary cutting edge against a rigid Burnley rearguard. However, the introduction of Eriksen proved crucial as Spurs moved back to within five points of league leaders Manchester City. Lucas Moura, who scored the crucial equaliser against Barca, was among those restored to the starting line-up and almost broke the deadlock with an improvised effort from Erik Lamela's long ball. Harry Kane had shouts for a penalty waved away but it was 30 minutes in until the first effort on target, which saw Lamela denied by some good work from Hart. Burnley had barely threatened early on but could twice have gone ahead, with Ashley Barnes heading over after an error from Hugo Lloris and then seeing a goalbound volley blocked. The visitor's time-wasting tactics were beginning to irritate the Spurs fans and players, but when Lamela finally had another clear opening 16 minutes from time, Hart again responded with a fine one-handed save. Substitute Son Heung-min scuffed a shot wide and Dele Alli failed to convert his cross with the goal gaping, but Eriksen eventually proved the hero, side-footing home Kane's pass to break Burnley hearts.